very easy to play. Just spin the wheel and if you can share with 2 friends to get a second entry. NO PURCHASE NECESSARY. GAME OPEN TO LEGAL RESIDENTS OF THE UNITED STATES RESIDING IN ONE OF THE FIFTY UNITED STATES OR THE DISTRICT OF COLUMBIA WHO ARE 18 YEARS OF AGE OR OLDER. VOID WHERE PROHIBITED. GAME ENDS June 17, 2012. 1. 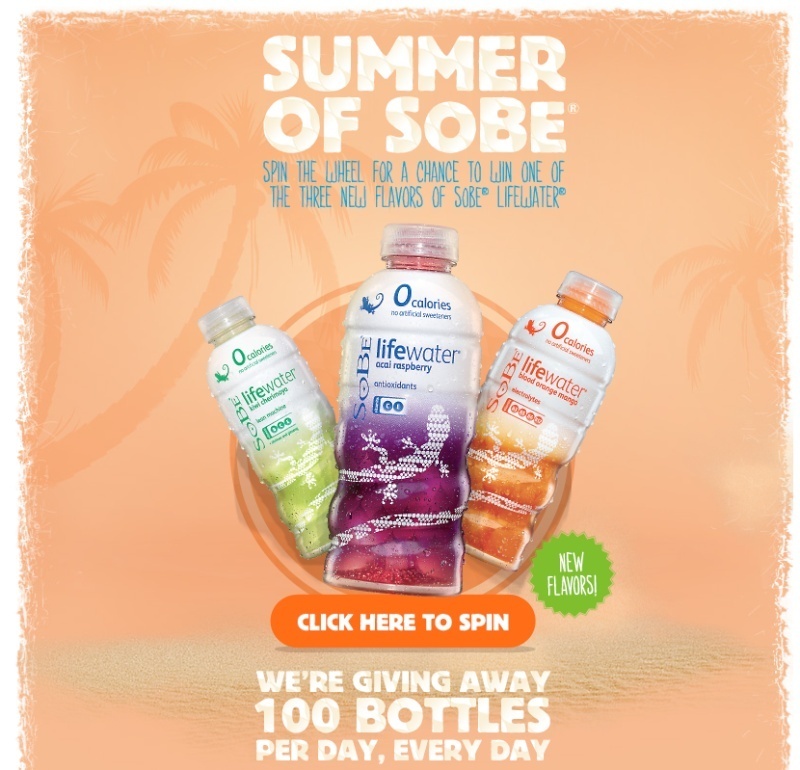 PROMOTION END: The SoBe Lifewater Facebook Summer of SoBe Game (the "Promotion") is scheduled to begin at 12:00:01 a.m. ET June 4, 2012 and end at 11:59:59 p.m. June 17, 2012 (the "Promotion Period"). 2. HOW TO PLAY: Each day of the Promotion Period, visit www.facebook.com/sobe (the "Web Site") and follow the directions on the screen to play the game (the "Game Play"). The official judging organization will determine at random the order in which the prizes will be awarded each day. Once the one hundred (100) bottles of SoBe Lifewater have been won each day, the website will not accept any more Game Plays for that day. The Odds of winning depend on the number of eligible Game Plays received and the order in which they are received each day. Normal internet access and usage charges imposed by your Internet service provider will apply. Game Plays must be completed by 11:59:59 p.m. ET each day of the Promotion Period. The computer clock of Sponsor's webmaster is the official timekeeping device of the Sweepstakes. 3. PRIZE: One Hundred (100) prizes are available to be won each day of the Promotion Period. Each Prize consists of one (1) 20 oz. SoBe Lifewater beverage. Actual product will be shipped to the address provided. ERV of each prize is $1.49. Sponsor will determine in its sole discretion which flavor of SoBe Lifewater will be delivered. Limit one (1) prize per person/e-mail address/household/facebook account per day. Limit of five (5) prizes per person/e-mail address/household/facebook account per Promotion Period. If you do not receive a Prize Confirmation message, then you did not have a winning Game Play and are not eligible for a prize. Proof of screen shot with winning message does not constitute proof of winning. Sponsor will not accept screen shots or other alleged evidence of winning in lieu of its Game Play verification process. 4. ELIGIBILITY: You must be a legal resident of the United States residing in one (1) of the fifty (50) United States or District of Columbia and 18 years of age (19 in AL or NE) or older at the time of entry to be eligible to win. Employees of Facebook, Inc., South Beach Beverage Company, Inc. and its bottlers, and each of their respective parents, subsidiaries, divisions, affiliates, distributors, suppliers, and advertising, promotional or judging agencies ("Sponsor and Promotion Parties") and the immediate family members of such employees and/or persons living within the same household as such employees are not eligible to win. 5. GENERAL CONDITIONS: Unclaimed prizes will not be awarded. No substitution of prize is offered, no transfer of prize to a third party is permitted and non-cash prizes may not be redeemed for cash value, except as determined by Sponsor in its sole discretion. Void wherever prohibited or restricted by law. Prize winner will be solely responsible for paying all applicable federal, state and local taxes on prizes; if applicable, winner may receive an IRS Form 1099 for the retail value of the prize. All participants agree to be bound by these Official Rules and the decisions of Sponsor and it's authorized judging agencies (the "Judges") whose decisions in all aspects of this Promotion shall be final and binding. If you do not receive a Prize Confirmation message, then you did not have a winning Game Play and are not eligible for a prize. Proof of screen shot with winning message does not constitute proof of winning. Sponsor will not accept screen shots or other alleged evidence of winning in lieu of its Game Play verification process. You are not a winner until your potential winning Game Play has been verified by the Judges in accordance with these Official Rules, and you have fully complied with these Official Rules. 6. VERIFICATION: All potential winning Game Plays are subject to verification at the sole discretion of the Judges. Anti-fraud detection and other devices may be used to verify winners. In no event will Sponsor be obligated to award more prizes than the number of prizes stated in these Official Rules. If for any reason Sponsor determines in its sole discretion that the Promotion is no longer capable of running as intended by these Official Rules for any reason whatsoever Sponsor may at its sole discretion cancel, suspend or modify the Promotion in whole or in part. For example, if due to mechanical or other error more prizes for a particular day are either made available and/or claimed than the number of prizes set forth in these Official Rules, then Sponsor may suspend prize awards for such prize and award any remaining unclaimed prizes (up to the total set forth in these Official Rules) in a random drawing from among all eligible prize claimants for that prize category as determined by Sponsor. 7. WINNER NOTIFICATION: Potential prize winners will receive their prize at the address they supplied on the Web Site. Any mail or prize which is returned as non-deliverable will result in disqualification. Sponsor is not responsible for mail or prize returned as undeliverable. Allow 8 to 10 weeks for shipment of prize by mail following notification process. Prizes will only be delivered to addresses within the United States. 8. RELEASE OF LIABILITY: All winners, by acceptance of a prize, agree to release Sponsor and Promotion Parties from any and all liability, claims or actions of any kind whatsoever for injuries, damages or losses of any kind to persons and property which may be sustained in connection with the receipt, ownership or use of the prize or while preparing for and/or participating in and/or traveling to and/or from any prize-related activity, or any typographical or other error in the Official Rules or the offering and announcement of prizes. Sponsor makes no representations or warranties of any kind concerning the appearance, safety or performance of any prize. The winner shall bear all risk of loss or damage to prize after it has been delivered. Upon request, winner must consent (and confirm such consent in writing) to the use of his/her name, voice, picture or other likeness without compensation for promotional purposes in all media as determined by Sponsor, except for residents of TN and where prohibited by law. 9. WINNERS LIST: For the names of the winners, please visit the Web Site between June 18, 2012 and July 6, 2012. 10. SPONSOR: South Beach Beverage Company, Inc., 700 Anderson Hill Road, Purchase, NY 10577. SOBE, LIFEWATER and the Lizard Designs are trademarks of South Beach Beverage Company, Inc.